See below for the latest stories on the U.S. 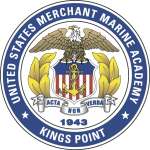 Merchant Marine Academy and its midshipmen. In recent weeks, some members of Congress have expressed alarm that the U.S. Merchant Marine is shrinking to a point that America would not be able to find enough cargo ships and merchant mariners to supply American troops in a distant war zone for longer than a few months.